Log Wall – uncut 6x8 Appalachian Round (D-log) Eastern White Pine logs 14 courses tall, Borate Pressure Treated. Also includes premium caulk, gasket and log home screws. All logs are individually grade stamped. Corner notches and door window openings are cut on the job site. Loft Framing – for 736 sq. ft. second floor. Smooth surfaced rectangular joists, girder beam and support posts. Also includes joist and girder hangers, adjusters for posts and girder beam plates. Porch Framing – for 8x40 front porch. Includes uncut Borate Pressure Treated rectangular rafters, top plate, support posts, board & batten trim and log home screws. Exterior Log Siding – Borate Pressure Treated Eastern White Pine for gables, 2 -8’ doghouse dormers & 36’ shed dormer. Optional items include Thru-bolts for log wall, structural beams or 2x conventional for roof, 2x6 tongue and groove for loft floor, porch roof and/or main roof, rigid foam insulation and sheathing for roof, exterior doors and windows, trim lumber, exterior stain/sealer. 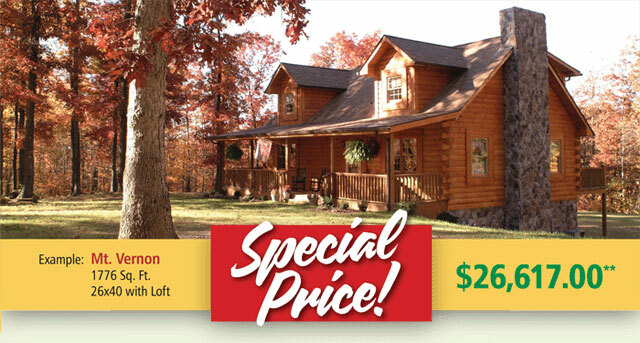 Ask your Log Home Consultant for Special Promotion Pricing on other Appalachian Log Structures’ pre-designed floor plans. **Special Promotion Price based on placing the order with a 50% deposit on or before December 15, 2018. Delivery must be taken by June 15, 2019. Note: ALSI pre-designed floor plans meet the following criteria – Roof 20# snow load, 90 MPH Wind Load in Seismic Zone 1.